All you need is a few minutes and your microwave to make this fall snack in a snap! 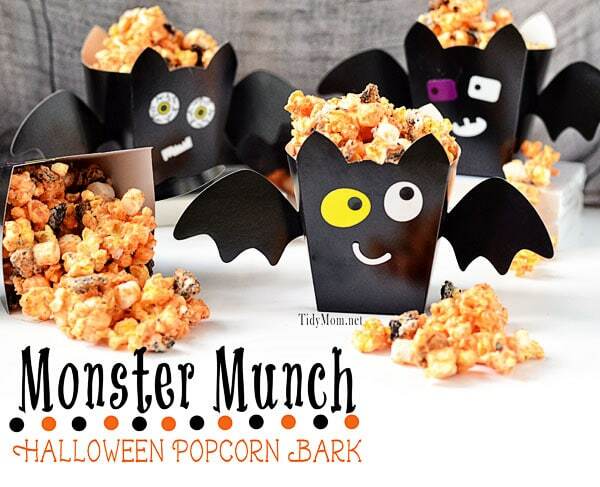 Monster Munch or Halloween Popcorn Bark, whatever you want to call it…..I call it crazy good! 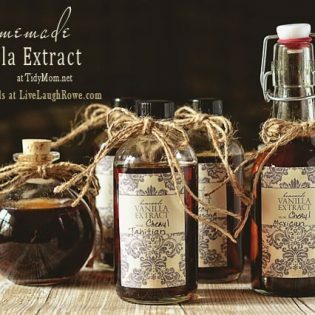 It’s a sweet & salty treat that everyone loves, and the recipe makes a lot so it’s easy to share. 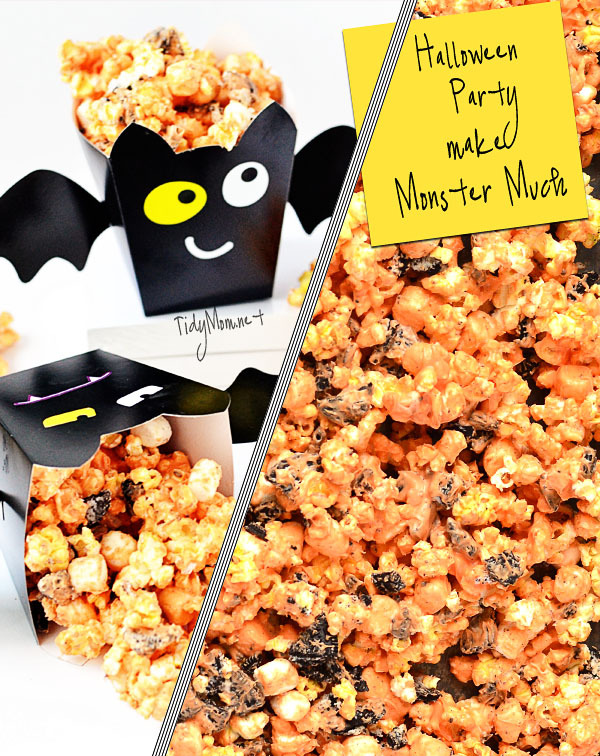 Oreos, marshmallows, buttered popcorn and Orange Candy Melts give it the perfect look for Halloween. I can’t believe Halloween is less than a week away! I couldn’t help myself when I found these adorable Wilton Bat Treat Boxes. I knew they’d be perfect for my Monster Munch! They’d be adorable for serving the popcorn at a Halloween party or passing out to co-workers, teachers, and neighbors. My girls and I love drinking hot chocolate and latte’s at home. Instead of using whipped cream or marshmallows on top, I got a silicone bat mold, filled it with COOL WHIP Whipped Topping and popped it in the freezer overnight. The next time I made hot chocolate, I popped a few bats out of the mold and placed them on top for a little Halloween fun! Sometimes it’s the quick and simple snacks are the best! Melt candy according to package directions, then pour over popcorn mixture using a rubber spatula to coat. Spread candy covered popcorn mixture on to cookie sheet lined with wax paper to cool and harden. Break up into pieces, store in airtight container. 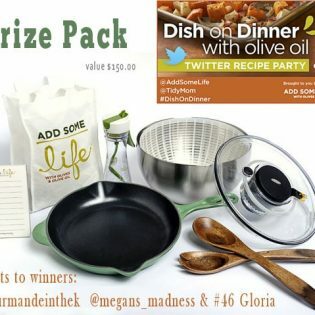 Dish on Dinner recap and winners! Oh, those Frozen Cocoa Cooler bats are the cutest things ever! Hey Cheryl, great popcorn. So much fun and so easy to do. Thanks for the party. I hope that you have an awesome weekend! Love this popcorn treat! Thanks for hosting. Thanks so much for this wonderful party, have a fantastic weekend! Thanks for hosting! I love using candy melts! Drizzling chocolate on anything makes it better and the candy melts come in so many colors/flavors Have a great weekend! So cute and clever! I’m sure the kids love this! Yum yum! I love this! So simple yet sounds so yummy, perfect for a classroom party treat 🙂 Where would I find boxes like that? A place like Michaels, Hobby Lobby or JoAnnes? How cute! What a perfect addition to a Halloween party! These are super cute! What a fun treat. Cheryl! THis is so cute!! I just love candied popcorn, and the bat boxes are an adorable touch. Also love the ease of the bat cubes! I love those bat molds and your creative use of putting cool whip in them! May need to try that soon! Thanks for hosting–enjoy your weekend! These are too, too cute!! 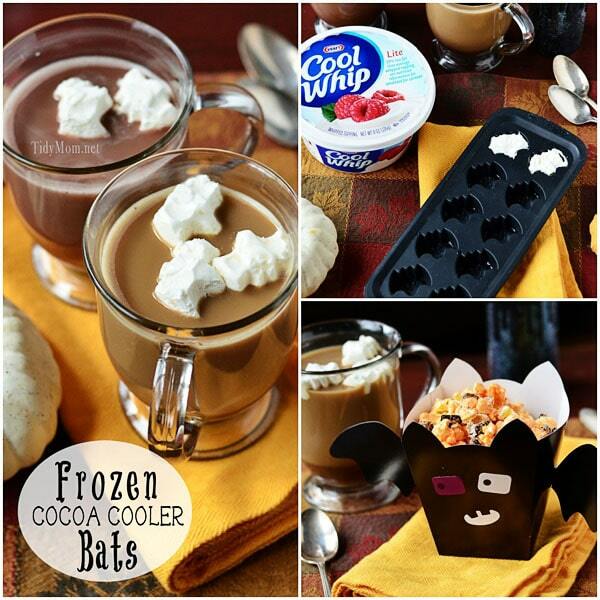 I especially love the bat cool-whip shapes for hot-chocolate. Great idea!!! So cute and I love the addition of oreo!! What an excellent Halloween treat, so fun!! My apologies for being MIA the last couple weeks for I’m Lovin’ It, but I’ve linked up today. Have a great weekend, Cheryl! Thanks so much for hosting! Your monster munch looks divine! I have to bring a treat to the school Halloween carnival and this will be perfect! Love the batty boxes too! i’m thinking i need to come over for a movie night for some cocoa & popcorn! so cute! i’m so late to the party, but thanks for hosting! This is great! Popcorn is a fave of mine. Yum! I love the Frozen Cocoa Cooler Bats!! YUM! I love that it’s sweet. For a second, I thought it was cheesy. 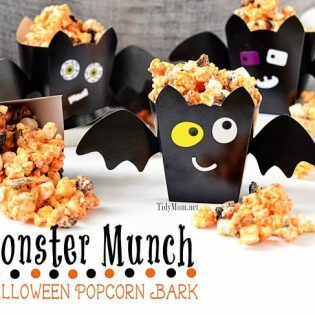 Those boxes are adorable, just perfect for your Monster Munch!